AUSA’s 121 chapters with their volunteer leaders and members across the country and around the world are our ambassadors, connecting our Association with soldiers and their families, Army leaders in their area, local corporate partners and our communities. Our AUSA mission: Voice for the Army – Support for the soldier. As a 501(c)(3) not-for-profit educational association, one of AUSA’s key roles is to provide relevant, needed and wanted educational opportunities for soldiers and their families. As part of the Veterans Day celebrations, I had the opportunity to visit and spend time with the soldiers, families and community members at Fort Lee, Va. 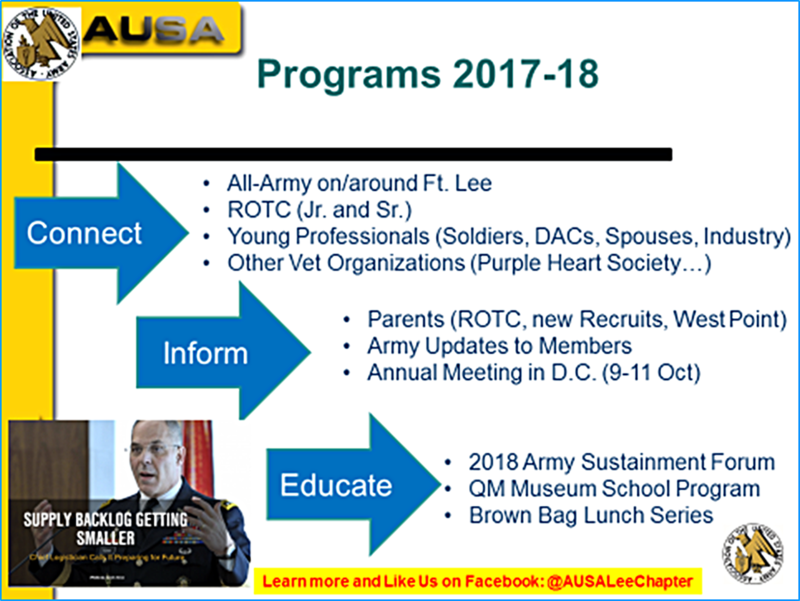 The Association of the U.S. Army’s Lee Chapter sponsored my visit and I used this great opportunity to join with the chapter and showcase AUSA’s educational and mentorship initiatives. To begin the day, one of the key events at Fort Lee was to participate in the chapter’s quarterly business meeting held in conjunction with an installation-wide breakfast. With more than 260 soldiers from the Regular Army, Army National Guard and Army Reserve, and Army civilians, Army and civic leaders, retired soldiers, veterans and families in attendance, the Lee Chapter did a magnificent job communicating its mission to educate, inform and connect with soldiers, civilians, families, and the Fort Lee community. In addition to the chapter using this venue to educate, inform and connect, the members also increased their chapter membership. In attendance at the breakfast were representatives from the Holiday Helper program, who raised $1,000 to support the installation’s programs. The Lee Chapter president, retired Col. Michael P. Flanagan, provided an update on the chapter’s activities to connect, inform and educate throughout the military and civilian communities. The “Great War,” as it was called, began in 1914, and for three years the United States remained neutral until the sinking of the British passenger liner Lusitania by a German U Boat claimed 128 American lives. Also, the continued attacks on merchant ships rallied the American people. In 1917, America’s Army had an enlisted force of 121,797 and 5,791 officers. Additionally, the Army had few trucks, lots of horses, few machineguns, little artillery and no tanks. America’s entry into WWI marked the birth of the draft with the Selective Service Act of 1917. Approximately 24 million men registered for the draft, 4.7 million served and 1.4 million deployed to Europe. The entire National Guard was drafted. As part of the growth of the Army, 41 divisions were created and 13 remain intact in today’s total Army force. For the soldiers who served, there were 116,000 deaths, of which 53,000 were combat related, and another 204,000 were wounded in the 18 months of combat service. Today, 100 years later, we still have the same questions and concerns about our place in the world and maintaining readiness that includes manning, equipping, training the Army and leader development. Now, with more than 187,000 soldiers deployed or forward stationed in 140 countries in six geographic combatant commands, soldiers and Army leaders are busy. Across the spectrum of capabilities, the Army must maintain American military dominance in all five domains – land, air, maritime, space, and cyberspace, and across the electromagnetic spectrum. Speaking at the home of the U.S. Army Combined Arms Support Command (CASCOM), soldiers and their leaders at Fort Lee see their relevance every day in support of the plethora of ongoing global missions. In addition to the breakfast, I had the opportunity along with AUSA’s retired Command Sgt. Maj. Troy Welch, AUSA’s director of NCO and Soldier Programs, to visit the Quartermaster, Ordinance, Transportation, and NCO Academy. Command Sgt. Maj. Nathaniel J. Bartee Sr., the CASCOM CSM, hosted my visit along with Command Sgt. Maj. Vickie G. Culp, who serves as the Transportation School CSM; Command Sgt. Maj. Terry D. Burton, the Ordinance School CSM; Command Sgt. Maj. Sean J. Rice, the Quartermaster School CSM, and Command Sgt. Maj. Anthony A. Traylor the Commandant of the two CASCOM NCO academies. I found the young soldiers attending Advanced Individual Training at the three component schools highly motivated and eager to learn their craft and to prepare for their first duty station for Regular Army soldiers or to return home as Army National Guard or Army Reserve soldiers. Of special interest was a discussion of progress in the Army Credentialing Program (ACP) and the Continuing Education Degree Program (CEDP). The ACP strategy is the Army’s effort to align military occupational specialties (MOS) and associated military duties with vocational certifications and licenses. A focal point for the ACP is for all soldiers to receive appropriate credit for their military training, education, and experience documented in a form which is transferable across the Army and civilian workforce. This effort promotes soldier professional development by expanding their military expertise while serving and, the transference of their knowledge, skills, and abilities when seeking civilian employment. Every occupation in the Army, along with the associated collateral and ancillary duties, has some level of alignment to any number of nationally recognized credentials. Training and Doctrine Command’s (TRADOC) efforts in these areas over the last five years – using the Army Career Tracker (ACT) and Army Credentialing Opportunities On Line (COOL) websites – provide soldiers credentialing opportunities identified by TRADOC’s occupational schools and centers. The ACP brings to the Army and our soldiers many key benefits such as enhancing readiness, promoting life-long learning, professionalizing the force (total force applicable) and enhances post-service employability. CASCOM is leading the Army in its efforts to identify credentialing, licensing or certification opportunities for all military occupations. Today, there are 34 enlisted and 14 warrant officer career fields enrolled in the ACP, with more than 40,000 soldiers who have completed the program. But there is still more work to be done for those MOSs that remain to match the Army’s training to a license, credential or certification. TRADOC’s Army University has the mission to expand public and private partnerships with academic institutions to ensure soldiers receive appropriate academic credit for their training, education and experience. The end state is for all career field branch proponents to identify a recommended credential and have at least one degree program established and codified in a professional development model for attainment by soldiers in the operating force and through self-development opportunities, accurately displayed on the ACT and Army COOL websites. These efforts are part of the Soldier for Life program and the life-long learning initiative for all soldiers throughout their military careers. Overall, it was a great day to be a soldier at Fort Lee and a great day to be a part of the AUSA Lee Chapter. We can all be very proud of the volunteers who serve selflessly to support our soldiers and their families, provide relevance and support to the Army commands, and tell the soldier’s story throughout our communities and across the nation.